Lumbini Tour is a Buddhist pilgrimage tour in Nepal. As per Buddhism, Siddhartha Gautama was born at Lumbini in 563 BCE. He obtained ultimate enlightenment and turned into Buddha emerging Buddhism. Besides Bodh Gaya, Sarnath, and Kushinagar, Lumbini is also one of these four magnets for devotees that sprang up in places pivotal to the life of the Buddha. 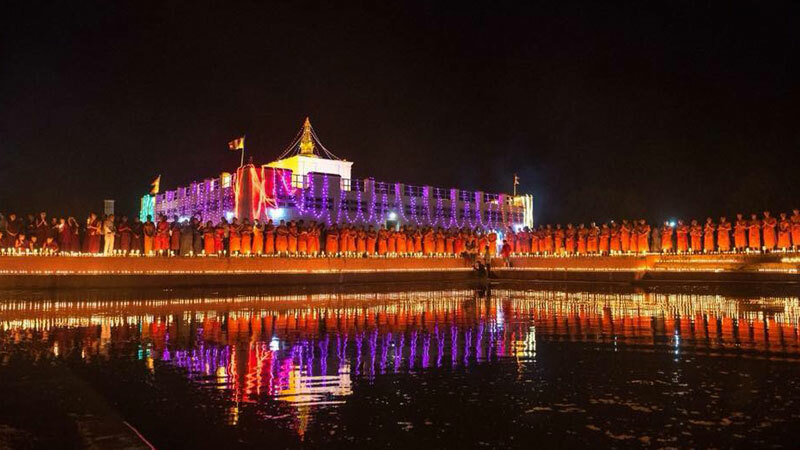 Yearly thousands of Buddha's follower visit Lumbini to pay homage to Buddha. The birthplace of Buddha, Lumbini has located 321 km to the south west of Kathmandu Valley in Rupandehi District of Nepal. Lumbini is situated at an elevation of 150 meters above sea-level near Nepal and India border. It is just 86 km distance from Chitwan and 170 km from Pokhara. Lumbini Tour Package combines a visit to the holy Maya Devi Temple, Sacred Garden, Marker Stone, Ashoka Pillar, Sacred Pond, Stupas, various countries monasteries, World, Peace Pagoda, Crane Sanctuary, Tilaurakot, Kudan, Gotihawa, Nglihawa, Araurakot, Sagarahawa, and Jagdishpur Lake. The holy place Lumbini is also listed in UNESCO World Heritage. Day 02: Drive to Lumbini. Today departing around 8 am drive to the holy Lumbini. Lumbini is 321 km from Kathmandu and takes around 8 hours by private vehicle.The way follows the Trisuli River and Marshyandi River for the first 4/5 hrs. Tirsuli River is famous for white water rafting and you may encounter the people boating here. Also, the famous Manakamana Temple is located en-route. There is Nepal's first cable car operator to visit Manakamana Temple. Arrival at Lumbini and transfer to the hotel. After traveling such a long distance take rest at the hotel. Overnight at Lumbini. Have breakfast at the hotel and proceed to explore the sacred garden where you can find the Mayadevi Temple, Marker Stone, Ashoka Pillar, Sacred Pond, Stupas and ancient remains. Moving forward visit Monastic Zone where various countries have built their monasteries like Chinese Monastery, Korean, German, Nepalese, Indian, Bhutan and many more. Continue to visit new Lumbini Village where we can observe World Peace Pagoda and Crane Sanctuary. Back to hotel and free time. Overnight at Lumbini. Day 04: Visit Buddha's Palace. After eating breakfast, continue our sightseeing to Kapilvastu. It is 30 km drive from Lumbini and takes around 1 hour. Here we will be exploring Tilaurakot where Buddha's palace remaining is keep protected, Kudan - the place where Buddha met his father after enlightenment. Similarly visit Gotihawa, Niglihawa, Araurakot, Sagarahawa, and Jagdishpur Lake. Completing today's activity drive back to the hotel and stay free. Overnight at Lumbini. Drive or fly back to Kathmandu. Transfer to your hotel. And free time. Overnight at Kathmandu. Begin the morning with breakfast and proceed to discover Kathmandu's UNESCO World Heritage Sites like Pashupatinath Temple, Bouddhanath Stupa, Swoymabhunath Temple, and Kathmandu Durbar Square. Back to hotel and free time. Overnight at Kathmandu. Take breakfast and you will have free time until 12 noon (hotel check out time). Then, transfer to the international airport for your onward destination. The time has come to say goodbye and bring the beautiful memories with you. Lumbini Tour Trip finished here! Twin Bed sharing (2-5 star) hotel accommodation at Kathmandu and Lumbini. Kathmandu to Lumbini and back by private vehicle. Lumbini Sightseeing by private vehicle. Entrance/Monument Fees during sightseeing at Kathmandu and Lumbini. Wants some modification on Lumbini Tour itinerary? contact us to customize it.